The Cleveland music director has pulled out of a Berlin production of Magic Flute, requiring a knee operation. The Staatsoper under den Linden have replaced him with the rising Mexican conductor, music director in Queensland, Australia. The director is Yuval Sharon, a close colleague of Welser-Möst’s. Opening night is Feb 17.
replacing a true musician with a charlatanesse .. Better her than the Herlitzius Elektra replacement the Staatsoper recently announced: the unbearable, underparted and underpitch Merbeth. What are they thinking, if they are at all thinking? I believe Barenboim is relinquishing the musical direction of Widman’s Babylon. Maybe the Staatsoper will give her that too. By that time she would have all of two operas in her repertoire (the Brisbane Carmen is legendary). I haven’t figured out yet whether she is a mediocre conductor or just that the SD-erati have it in for anyone besides Carlos Kleiber or anyone under 80 (4 more years and Barenboim is in the clear). I remember not that long ago that FWM was referred to by many as “Frankly Worse than Most.” But he aged 20 years, grew a few grey hairs, and now he’s the A-lister whose replacement by the young (and I suspect not coincidentally, female) prompts renewed carping. The fact that he was and still is far from brilliant doesn’t make her any less awful! Norman Lebrecht’s posts and SD reader comments can be starting points for further thought and research. 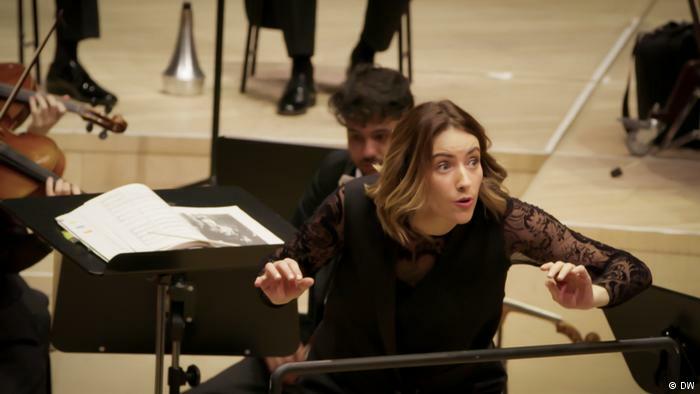 – Alondra de la Parra: I have no opinion but out of curiosity I looked into that excerpt from Márquez’ Danzon n° 2, now famous by that infamous rehearsal video. Actually in concert with the same orchestra I don’t see her do dance (see 6:07 at https://www.youtube.com/watch?v=pjZPHW0qVvo ), and even prefer her performance over Dudamel and the Orquesta Sinfónica Simón Bolívar (6:28 at https://www.youtube.com/watch?v=Z8Fml4kGf38). Say what you want about the Dude and his Venezuelan orchestra in the classics, but they are a good fit for latin American stylized dance music. – Franz Welser-Möst was nicknamed “Frankly Worse than Most” by the LPO players, when he was their principal conductor (1990-1996). Thereafter he headed the Zurich Opera (1995-2000) and took over the Cleveland Orchestra in 2002. So, arguably he was an a-lister by 2002, about a decade after “Frankly Worse than Most”. I don’t think he won the day only because of a few grey hairs. I agree, honestly this piece can be extremely boring if inspiration is not forthcoming from the conductor. The parts are pretty sparsely indicated, and sterile performances at the hands of less-spirited conductors abound. Do you know how many singers in the world sing this role? Do you know how many of them are available? Maybe you want to check and make some suggestions. You could have just written “charlatan”. But that wouldn’t have revealed the real reason you don’t like her. Actually, she’s got a very fine reputation!! There is serious music in Australia; ask Barry Kosky!!! A joke with a baton. Before someone accuses me of sexism: women can conduct; Alondra de la Parra can’t. What business does Welser-Mōst have conducting opera in the first place? I hope the reviews for Maestra De La Parra are stellar. What business does Welser-Möst having conducting opera in the first place? I hope the reviews for Maestra De La Parra are stellar. Good luck! Ms. de la Parra has a formidable chance to prove herself. There is nowhere to hide with the Magic Flute: very subtle music. And she has shirked her commitment to the Season Opening concert with Paul Lewis and Queensland Symphony Orchrstra – of which she is Music Director – in order to take this gig. Unprofessional conduct in anyone’s book. Apparently her QSO contract hasn’t been renewed, so what does she care? So typical of her! She once canceled almost on the last minute some commitments with the São Paulo State Symphony Orchestra alleging that she was too far along on her pregnancy to travel, but was seen conducting in Europe shortly after! Thanks to that, this was the last invitation she got from their amateur and dazzled artistic director. The orchestra couldn’t have got more relieved! Has anyone ever said anything nice about this conductors work? I have played on the same stage with her and have nothing remotely positive to say about her performance in rehearsal or concert. I have never met anyone else in the field of orchestral playing who has had any type of positive experience with her as a conductor. What is appealing to promoters, other conductors or audiences? What appeals to promoters and audiences? I have played under her as an musician in an orchestra before, and unfortunately I must say that she is not up to par. She simply does not have the analytical intellectual, nor the artistic/emotional talent to ever be even a “good” conductor. Too bad that the 2 old folks, Simmon Rattle and Kurt masur wanted a pretty lady to look at (I can’t imagine any other reason in this case), and allowed her into the conducting scene she’s simply out of her league in. I wonder what all the fuss is about, all the polemic! Ms La Parra will either be wonderful or not. Or somewhere in between. Zauberflöte is both simple and, therefore, really tricky. I hope she makes a great success of it. As a production the new one has to succeed a classic, which, for the moment at least, will continue in parallel. I have played under her and therefore must stay anonymous. She is a terrible conductor, lacking in the basics of interpretation, musical understanding and technique. She is beautiful and photogenic, I attribute those qualities to her success thus far. I was a member of POA from nearly the inception…Alondra is many, many things, but a good (or even moderately competent) conductor appears nowhere on any of those lists. Calling her a charlatan is doing her a tremendous kindness.